My mother enjoys writing for the blog, which saves me some time since I’ve recently started a very busy job that leaves me too exhausted to write when I get home. This one is about Katsudon, one of my father’s favourite dishes. After a hard working day, a hungry man is wolfing down Katsudon at a greasy diner by himself. When we think about Katsudon, this is the image portrayed. 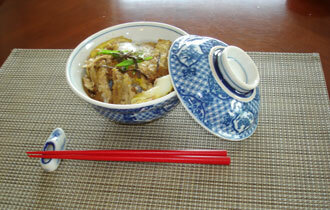 Katsudon is the dish for commoners and working class people. Because rice is the main part of a Japanese meal, good manners dictate that it should not be mixed with side dishes. Rice should be eaten plain, and remain white rather than soaked in sauce like it is in Katsudon. Katsudon is a dish which has everything, including meat, egg, vegetables and rice, all in one bowl. When you order Katsudon at a restaurant, it usually comes with Miso soup and pickles. If you have pork cutlet already cooked, Katsudon is very easy to make. If you think it is too much trouble to make a pork cutlet, you can use store made schnitzel. When we traveled to Vienna, we met a Japanese guy who was the owner of a restaurant in the subway. He started to speak about Vienna Schnitzel. 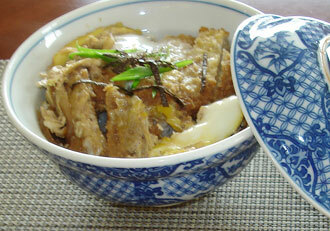 It is good for Katsudon and very big, its shape similar to a Japanese straw woven slipper. First you cook sliced onion with Japanese soup stock, soy sauce and rice wine. Water instead of soup stock will be fine though soup stock enhances the taste. Cook the onion until tender. Cut a pork cutlet into bite sized pieces. Place them over the cooked onion, and then cook for few minutes. Beat one egg. Pour it over the cutlet and continue to cook on slow heat. When the egg is almost cooked, place everything over a steaming bowl of hot rice. If you prefer the egg to be fully cooked, simply keep it on the heat a little longer until it is. However, runny eggs continue to cook when placed on the hot rice. Garnish with green onion and dried seaweed. I usually cook more pork cutlet than I need. First I eat the pork cutlet (tonkatsu) as it is. Then, I freeze the rest of them. So when i make Katsudon for dinner, I just defrost what I need. I love the image of the hungry Japanese working man eating his KatsuDon — of course, the perfect image of classical cuisine is not the same as food that regular people eat every day. Thanks for this recipe! We’re glad we could be of help to you!